Testing your swimming pool pH is one of the most important water chemical tests to your swimming pool water balanced. When testing pH, what you are really measuring is how acidic or how alkaline the pool water is. 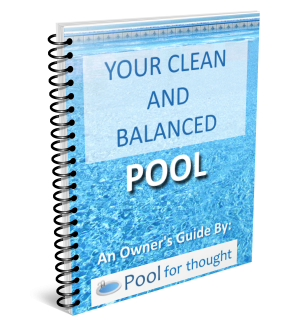 If the water pH is too far one way or the other, and you risk ending up with unbalanced pool water. Although in this article I am focusing just on testing pH, you can also learn more about how to maintain your pool pH, where we discuss the recommended pH range for your pool and what happens if the pH level is too high or too low. After reading this article and testing your pH level, read further on lowering your swimming pool pH or raising your pool pH. Why test your swimming pool water pH? 1 Why test your swimming pool water pH? If your pool pH is low or high, the water might still appear clear, so it is important to keep an eye on pH even though your water looks fine. I realize that testing pH every day is beyond the patience and commitment for most people. Work, kids, hobbies, errands, and even using the pool get in the way of testing the water, but it’s one of those necessary things to keep your pool clean, safe, and prevent damage to your pool equipment. Generally, the more you use the pool, the more you should test. If you are in the pool every day, then you should be testing the pH every day. As chlorine is another level to watch closely, you might as well be testing both pH and chlorine at the same time. If you are planning on a large gathering of friends or family, you should test several days prior to make sure all your chemicals are balanced, not just pH. Testing early will give you time to correct the water if there are water balance issues before any swimming pool gathering. You can avoid a bad scenario of cloudy water, or worse – the pool water so out of balance you have to not allow swimming. You’ll have kids in swimming suits and goggles showing up, only to tell them that they cannot get in the pool! The big advantages of test strips is that they are easy to use, are fairly inexpensive, and it is quick to do a test. A disadvantage is that they are difficult for colorblind people to determine the color results on the strip. Here are some general instructions that apply to most test strip products. Make sure your pool is open if you have a cover. Make sure your hands are clean and dry. Read the package instructions – especially the part on how long to hold the strip in the water. Remove a pH test strip, and close the test strip container to prevent any unwanted water or moist air to contaminate the other strips. Dip the strip into the water, about the depth to your elbow, and in a well-circulated area of the pool. Keep the strip in the water, usually about 30 seconds, but according to the strip maker’s instructions. Remove the strip and lay it on a flat surface. Compare the color on the strip to the color chart included with the test strips. You should be able to estimate the pH of your test based on the color of your strip. Test strips can lose their effectiveness over time, even if stored properly. I recommend you only buy enough for one pool season, or enough for one year. If you like gadgets, an electronic pH tester might be right for you. Electronic pH testers are as easy as test strips, but may need occasional re-calibration. These testers will always give you a ‘number’, but you need to follow directions to make sure the device gives an accurate reading. A downside is they are battery powered, and the battery will need to be replaced eventually. Keep them out of sunlight and out of the heat for prolonged periods. A key advantage of electronic testers is that they show a pH number for a result, so this avoids problem of color blind individuals not able to read test strip results. We recommend using a test kit that tests pH, as well as other pool tests. A test kit is the most accurate method of testing pH, but this requires more time, but they are more expensive than the other testing methods. The test kit reagent bottles also expire over time. Reagents usually they last only one year, but we have used ours for several years before noticing their ineffectiveness. Keep reagents and your test kit out of sunlight and out of the heat. Follow the recommendations of your pool supplier, the instructions on the bottles, or in the test kit instructions. Keep your test kit indoors and within easy reach for testing. We keep our test kit near the pool patio doors, under the sink in our downstairs bar area. The lower level is cool, and under the sink is dark. This is where we keep a few of our less-caustic chemicals, empty pool water sample container, a few notebooks, a flashlight, a scissor (for opening bags of shock). Don’t mix reagent bottles from other manufacturers. For example, if you have a Taylor test kit, only buy Taylor brand reagents. You can buy inexpensive pH test kits, but they only test a couple things. Buy a nice test kit that covers a wide range of tests. Get your test equipment ready. You will need the following: A pH comparator tube. Reagent phenol red (such as Taylor R-0004), sodium thiosulfate (such as Taylor R-0007), acid-demand reagent (Taylor R-0005), and base-demand reagent (Taylor R-0006). Rinse the pH comparator tube. Dip the pH color tube in the pool to your elbow and fill the tube to the top line. Add five drops of phenol red reagent, drop by drop. Compare the color of the water to the pH color scale. If your pH is high, add the acid-demand reagent drop by drop until the color matches the 7.4-7.6 range. Look in the test kit chart for this reagent and convert the number of drops based on your pool size to the amount of pH increaser (muriatic acid or sodium bisulfate) you need to add to your pool. If your pH is low, add the base-demand reagent drop by drop until the color matches the 7.4-7.6 range. Look in the test kit chart for the base-demand test to determine how much soda ash to add based on the volume of your pool. If you have a local pool service provider that provides free pool water sampling, take advantage of this! I would add that if you are using their pool water testing service, then do business with them. Buy chemicals when needed, ask questions, and maybe have them do your pool opening and closing. Every year our service provider hosts a ‘spring opening’ event at their main location in town. They have food, drinks, and I get a chance to meet and talk with all the staff and ask questions, and whats new for the year. Plus they offer a one-day big discount on all chemicals purchased that day. When using the test kit, did your water turn bright purple after adding the phenol red reagent? If so, this means lower your chlorine level. Repeat the test, but add a couple drops of the sodium thiosulfate after adding the phenol red. This will remove the chlorine in the test sample. Did the water turn lime green after adding the phenol red? Your pH is VERY low, likely acidic enough to corrode the metal surfaces in the pool. If your water turns orange, then drifts to pink, this shows your pH is unstable and your should test your total alkalinity next. If you add bromine to your pool, the resulting color may be wrong. You will need to follow instructions for testing pool water with bromine added, as the color results for this pH test not be correct. Once your water is pH-balanced and you used a test kit, you may want to use test strips for testing in between test kit tests, and use a test kit once per week or however you feel is enough to maintain your water balance. Maintaining swimming pool pH is one of the main controlling factors of balancing your swimming pool water. Keeping pH in check will help keep the other chemical balances in check as well and help you keep your pool clean, balanced, and with less maintenance and expense.